Hooves can crack for many reasons, in both the summer and winter. If you notice your horse does have cracked hooves, trying to prevent these splits and cracks from getting bigger is a good idea. With hooves growing between 7mm and 10mm a month, it can take a while to get ‘rid’ of cracked hooves, and that’s one reason why trying to prevent the issue and being aware of the possible causes is a good idea. Please note that in this blog we’re talking about superficial cracks. If your horse has injured his hoof and caused a deep crack that has damaged the hoof structure, you will need assistance from your vet or farrier to ensure it regrows correctly. A hoof can crack due to the environment it’s exposed to, and it’s not just dry weather that can cause cracking – rapid changes from wet to dry can also cause issues. 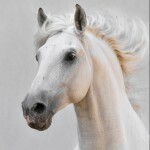 Another factor is the horse’s bedding, which can draw moisture out of the hoof. If the horse has been stood in a wet field all day, ‘drying out’ isn’t necessarily a bad thing as the hoof wall is porous and will absorb water, and this can cause it to become weak. However, if a horse is stabled all the time, it could cause an issue. A healthy hoof wall will typically have a moisture content of about 25%, although this does vary from horse to horse. Keep in mind that to help prevent cracks, it’s important to try and maintain the correct moisture level. Using moisturising lotions, balms and gels, in addition to good hoof care, can make a difference. Regular visits by your farrier will play an important part in helping to prevent cracks as uneven foot balance may be a factor. You might also find that a hoof in need of a trim can appear to be in much worst condition that it actually is. Cracks in the front hooves may also be a sign of contracted heels so it is worth discussing this with your farrier so they can analyse and trim accordingly. Generally speaking, if only one foot is affected, nutritional deficiencies can be ruled out. However, if more than foot is damaged, it is sensible to consider your horse’s diet and make changes accordingly, possibly adding in a specific supplement to assist the production of strong hoof horn in the future. 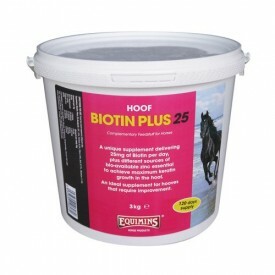 Hoof Mender 75 is ideal for hooves in need of repair with Biotin Plus 25 being good for hooves in need of support, and Biotin 15 for general maintenance. Some horses are born with weaker hooves, and these will require additional care. The saying no foot, no horse is true today as it was years ago. For superficial cracks, focus on maintaining correct moisture levels, to keep the hooves in optimum condition. If the environment is making this difficult, consider looking at hoof moisturising products. If the horse has poor quality hoof condition, look at hoof supplements that will help to promote strong, quality hoof growth from the inside. If you’re concerned about your horse’s hooves, they’ve sustained injury or the cracking has caused lameness, consult your vet or farrier.